CUAT Conference, Summer 2017 – Our Trainers’ turn to be trained! 6th September 2017 - CUAT Conference, Summer 2017 – Our Trainers’ turn to be trained! 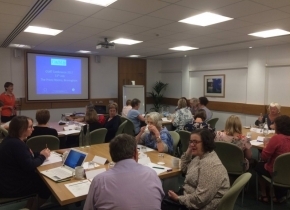 During the summer, it was once again the turn of the Catch Up® Accredited Trainers (CUATs) to take part in their own training and update at our CUAT conference! These conferences are organised twice a year for the trainers – this one taking place at The Priory Rooms, our Regional Training Centre in Birmingham. celebrating the amazing success of Catch Up® during 2017 so far – over 1600 more people have been trained to deliver the interventions or booked on courses! hearing that we now have 28 Regional Training Centres (RTCs) across the UK! learning that more than 300 schools are already using the fantastic Progress Reporting Tool – and have reported how useful they are finding it! being updated on the Day 4 training courses which are fully up and running at the RTCs from September 2017 – including having a preview of some of the terrific new one-hour workshops, all bookable online!